Crowns are made of a variety of different materials, and new materials are continually being introduced. The choice of crown depends on a number of factors including cosmetics, quality of the remaining tooth structure and function of the tooth. We will discuss the various options with you, and advise on the best option for you. 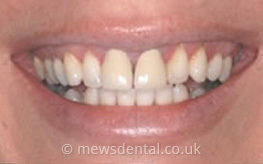 Crown preparation involves shaping remaining tooth to the precise dimensions, taking of impressions and choice of colour shade . These are sent to our highly skilled technicians, who produce the individually designed crown. The crown will then be cemented by the dentist two weeks later. 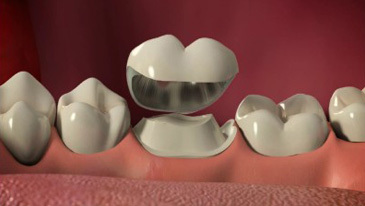 A temporary crown will be placed to protect the tooth while the permanent crown is made. 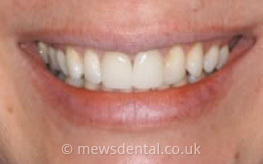 We may advise that you visit the technician in person, so that he is able to see the shape and colour of your teeth, so enabling him to produce the perfect result. The longevity of any crown is dependant on the standard of appropriate homecare by the patient. The crown itself cannot decay, but decay can start where the edge of the crown joins the tooth. Therefore it is important to keep this area as clean as possible with thorough toothbrushing and the use of floss or Tepe brushes. The dentist and hygienist will give you individual advice regarding the homecare of crowns, so that their lifespan is maximised.